Sunday, April 30th - St Petersburg, Florida. 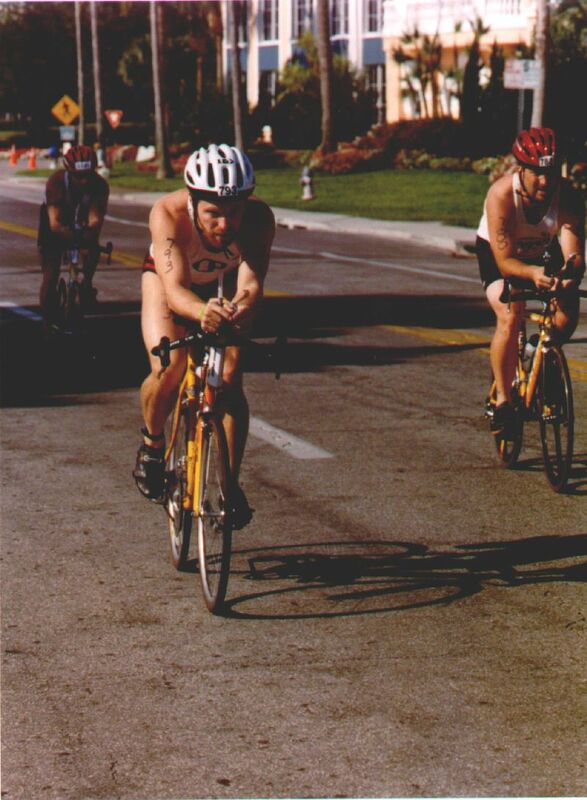 I competed in my first international distance triathlon: 1.5Km swim, 40Km bike and 10Km run. So did my friends Carlo Ciuffoli (Oracle colleague), Cameron Martz (WKPP diver and personal trainer) and Jonathan Bojar (WKPP diver). I had a great time even if I could not even get close to Cameron's result who was (quote from him) "in my worse shape ever". Carlo was my kind host. We met on Saturday afternoon to watch the professionals racing. These guys have all the same physique, it is strikingly obvious: 6 foot high or more, swimmer's shoulders with a lean runner's body. We picked up a lot of tricks from watching them do the transitions. Cameron had told me about these things, like shoes on the pedals, no socks, helmet positioned so that you can just put it on your head, buckle up and go. Carlo and I then did the registration, bought too many little things and then did a quick tuning workout. We went to bed at 10pm after a nice pasta meal that we cooked at his place. 5:00am - we got up, swallowed some breakfast and were gone before 5:30am. We made it to the race location before 6:00am, plenty of time before the 7:45am start. It is surprising how time flies: by the time we got the body markings done, did some warmup (run, bike and swim), stretched, went to the overcrowded bathroom, placed the bike in the transition area, positioned all the gear and got ready for the swim, it was time to start! 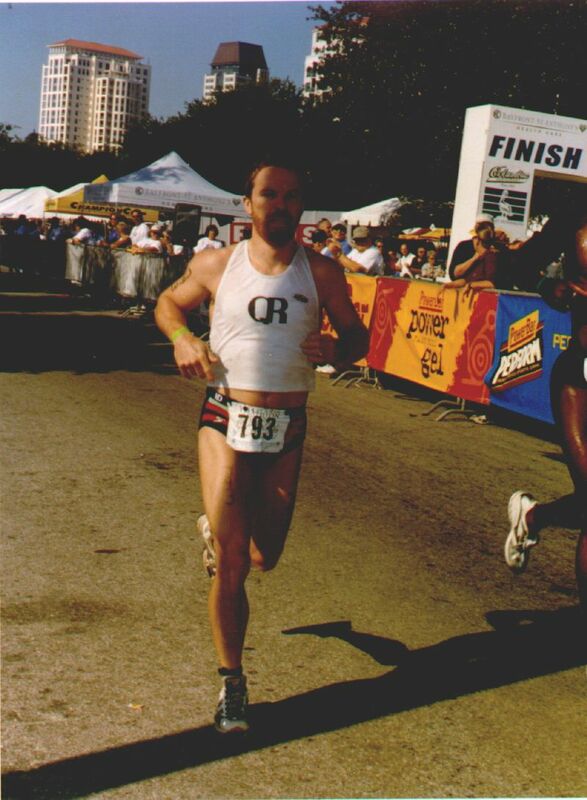 As this was my first race of this duration I chose to be really careful not to overspend my energy. The swim was slow for me. I decided at the last minute not to wear that nice wet suit I bought. I wanted to simplify the transition and did not want to deal with too many new things on a race day. I do not have much experience of bumping into many other swimmers, having not navigate from one buoy to another and managing currents. 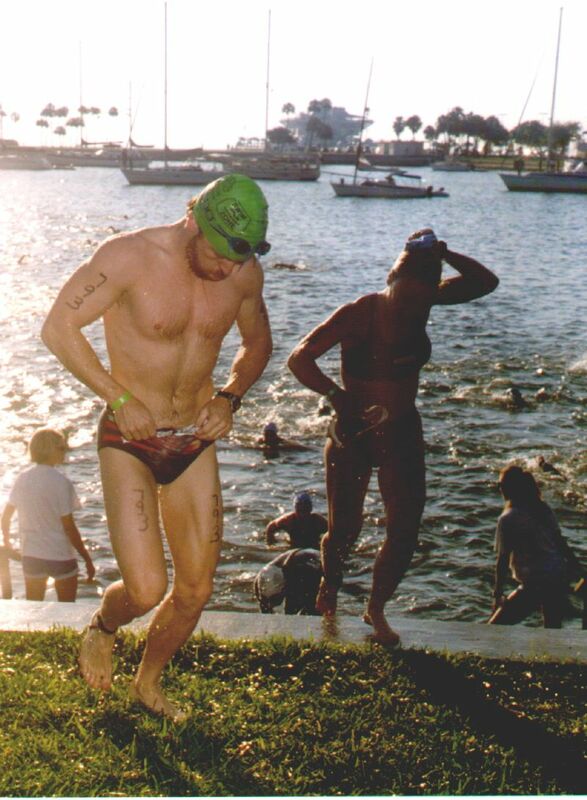 All in all I did not start to swim properly until 15 minutes into the race. The main thing I learnt from this is that there is no substitute for racing experience. I should have done a bunch of smaller races before this one. I got out of the water after a 29 minute swim and run towards my bike. The transition went well, except I was under the impression that we had to wear a shirt so I wasted some time putting it on. I run bare foot with the bike and did aa OK job of putting my shoes on while I was riding. I took the first 10 minutes easy (19-20 mile per hour) and spinned my legs faster than I normally would in order to warm them up nicely. Then I picked up to 22-23 miles per hour, sometimes 25 unless the wind or the many curves would slow me down. I finished the bike leg in 70 minutes which means that my average speed was 21.3 miles per hour (34.3km/h). The course was pretty flat. The only things that would slow us down were the many curves, the chunks of cobblestone road and a lot of wind on the way back. It took me 1 minute and 42 seconds to park my bike in the transition area, remove my helmet, change shoes and get out on the run course. At that point I was 100 minutes into my effort but fresh enough to my liking. I was pleasantly surprised to clock a 7:35 first mile. That was my half-marathon pace. I felt slower than this for some reason and I was having some stomach cramps. So that meant that I could go faster and I did. The speed work that I did at training was paying off. My next miles were in the 7:20 range and my last 2 miles were 7:10 and 7:09. In the last mile and a half I was being careful as I started feeling some muscle above my knee twitching a little - cramps coming! I did drink everything that came my way -- we had water stops at every mile, bravo to the organization. When I saw the finish line with the clock at 1:28:20 I sprinted to make it a 1:28:59. I got 1:29:00 which is one minute faster than I was hoping for. Cool! There was plenty of food and drinks for all of us, even a massage tent. The organization did a really good job. The only painful thing is that we were not allowed in the transition area until the last competitor started the run. As soon as I could get to my bike (30+ minutes wait) I started a 5 hour drive to Tallahassee. I made it at 4:30pm and had a nice meal with Nanci. Here are the detailed results of my friends, me and a few others like the first, the last and the oldest competitors (amazing!). Some split times were not available. 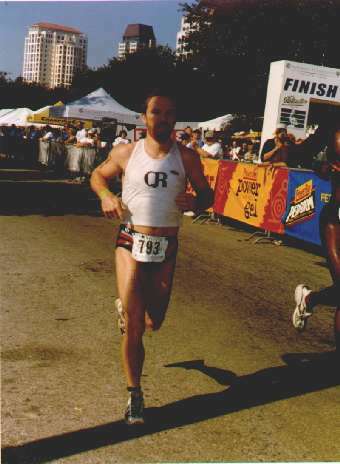 My next big event I will be training for is the Marine Corps Marathon, on Sunday, October 22nd 2000. 22,500 runners!!! !